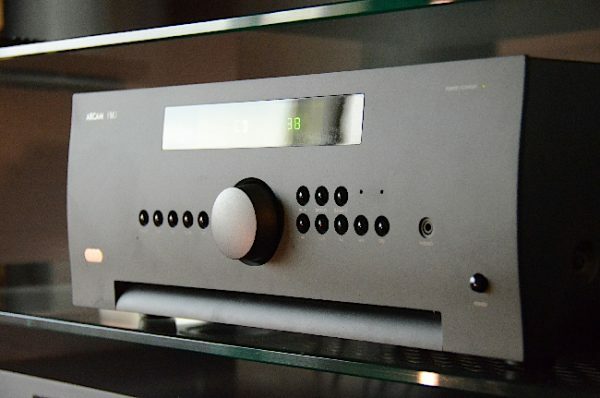 Arcam of Cambridge deliver their first Mega-Amp, the A49, a High-End Glass-G Integrated Stereo Amplifier, built in their US factory to deliver serious Real World Power, Class-Leading Sound Quality and Incredible High-End Value. Big, hugely powerful, expensive, but incredible value in market context, the FMJ A49 is a stunning new Hi-Fi amplifier, designed with a 'money no object' build remit. Arcam Founder John Dawson was given the task of building the best amplifier he could and he has produced one of the world's finest stereo amplifiers, one that can compete with markedly more expensive competitors. After pilot production runs, full-scale deliveries are now starting for the UK market and most Arcam dealers have the A49 on demonstration. There is currently a waiting list for retail orders of approximately three weeks. The Arcam A49 uses Arcam's ultra-refined class G amplification, which allows the A49 to run in full class A for the first 100 watts and then switches into class AB for anything more that is required all the way up to 400 watts into 8Ω. To hear just what this delivers, try a piece of music you thought you knew and hear it as it should be heard. The new amp uses extremely advanced circuit design, is built on a massive, robust chassis and is fully balanced throughout offering the lowest distortion, lowest noise-floor and the highest power ever, from an Arcam amplifier. With a class G amplifier, toroidal based power supply, acoustically damped chassis, paralleled transistor output stages and exceptionally low levels of distortion and noise the A49 is capable of reproducing music with all its original authority and detail. The A49 features dual mono volume controls and a balanced signal path all the way though the amplifier together with distortion-nulling input multiplexers. During normal operation, distortion is measured in less than one part per million so that this massive power is deliver with total control and finesse. A Complete Guide to Concealing and Hiding Cables – the Canadian way!